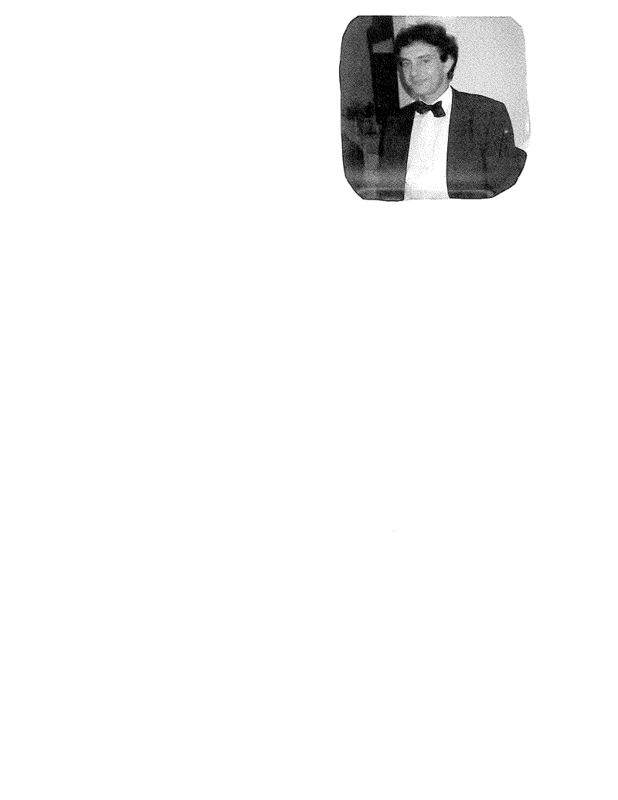 I’m afraid I’ve got nothing else…this will be the shortest post since day 1, before Tie No. 1 (this is Tie No. 55, by the way) even was chosen. Sorry, but the sunny weather outside is just not conducive to typing. In advance of this Friday Freebie getting made available, I want to thank last week’s contestants, Nicole Colin and Elizabeth Brehm. Not only were they a part of the first contested FF, they were really gracious in winning (Elizabeth) as well as falling just short of victory (Nicole). So, for the first time, it worked out. No bodily, construction or natural disaster fluids were involved, just felt that there was no reason to pack up a suit set to scrunch into the lockers at the McGaw YMCA. My Tie du Jour is from Ermenegildo Zegna, a classic Italian designer. I found this tie years ago, and it seems to pop off of this white shirt (of course I had to have a staid, white shirt in my Backup Plan Suitbag). I was able to dress up whitey with some cool cufflinks, that I had made. About a month ago (and I think I’ve mentioned this), I was passing Ayla’s Originals, a bead/jewelry store on Sherman Avenue, and the beads on a bracelet caught my eye. As slow as my brain is sometimes, I get creative idea flushes sometimes. ‘Creative Idea Flushes’ is a term I just invented this very minute to describe a few moments where a plan is put together almost instantaneously to do something, well, creative. 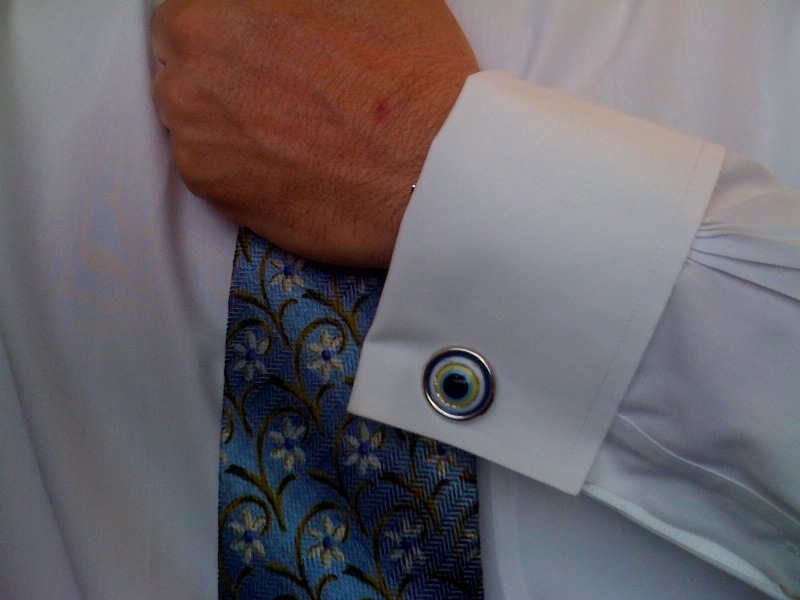 Anyway, I saw these beads (called Turkish Eyes), and knew that I wanted to put them on cufflinks. That set me to seeking out cufflink hardware (or findings, as they are called), which I found. I had the folks at Ayla’s put together three pair out of agate-type beads first off. Then we got more creative…I bought the actual bracelet from the window (for all of $3) and had Ivy, from Ayla’s, make 5 cufflinks out of it after removing the beads from the chain. So, I have a pair to give away, and, in keeping with the backup theme, that 5th-Wheel-of-a-Cufflink, is now a backup, in case one is lost. 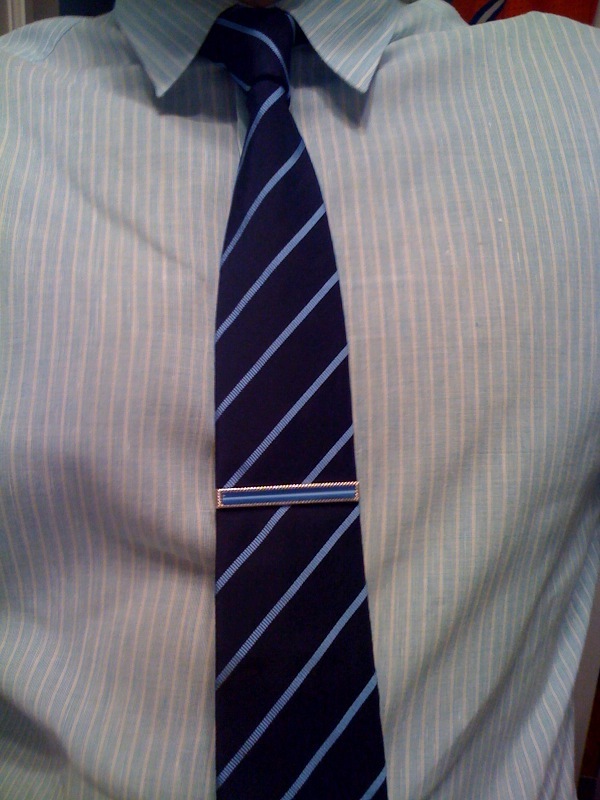 So I had a successful parting with two ties yesterday, and a challenge to get rid of another one today. My 2nd-place contestant from the last Friday Freebie, Nicole Colin, graciously accepted the consolation tie; I assured her that it took a special submission from my cousin Elizabeth to knock her from her perch. So, the multi-striped green Perry Ellis from last week stays local with Nicole, while the blue & green Kenneth Cole will be sent to Texas, where it will grace the neck of Elizabeth’s husband, Tim. Be sure to send pix when it gets there! It’s been extremely sunny the past few days here in the Evanstonland region of Chicagoland, and my Tie du Jour reflects that pretty well by, well, reflecting sunlight. 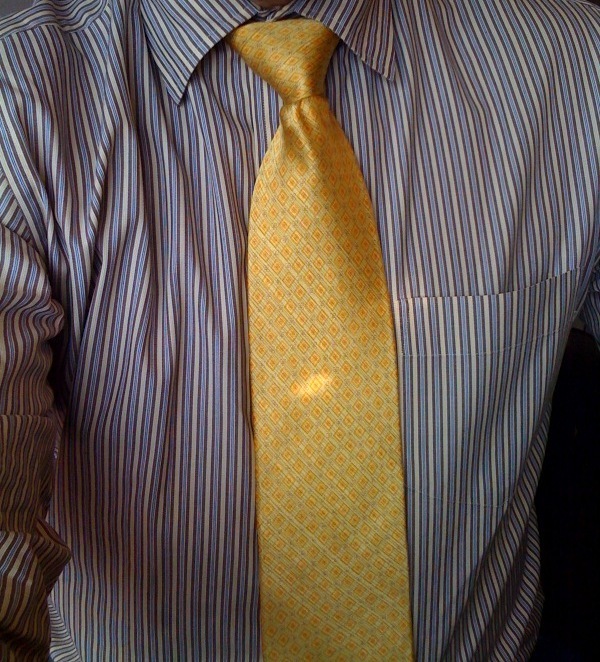 My bright yellow beacon of shiny tie-ness is from Zanzara, and I found it at Unique Thrift Store at Howard & Western. Their ties are priced at 99 cents, and depending on the color of the label, can be had at a 25% or even 50% discount. I have at least 20 ties (meek understatement alert!) from Unique. After posting three Guys With Ties yesterday, I realized that I forgot that I’d taken another picture early in the morning on my way out to work. Christopher Dale, my upstairs neighbor, was sporting this tie and heading off at the same time. He works down on 63rd Street on the South Side, and shoot if I can’t remember who it is. Darn brain! I had some more visitors to the office today…Brandon Bowers and Billie Kershasky of Astor & Black, a custom men’s clothier. They sell mostly suits, but have all the accoutrements. Fantastic swatches, and I hope to become a customer soon. While Brandon enters the pantheon of Guys With Ties, Billie becomes the charter member of Girls With (Guys With) Ties. I was actually extra proud of this sales call, as I referred Billie to Brandon a few weeks ago as part of her job search. She is a great friend and is going to be a fantastic salesperson for A&B. Julia, my daughter, is an heiress to a small fortune. The key word there is ‘small’, and ‘fortune’ is a tongue-in-cheek reference to the fact that she had better luck out and marry well, or hope that I perish at the fault of a rich corporation. 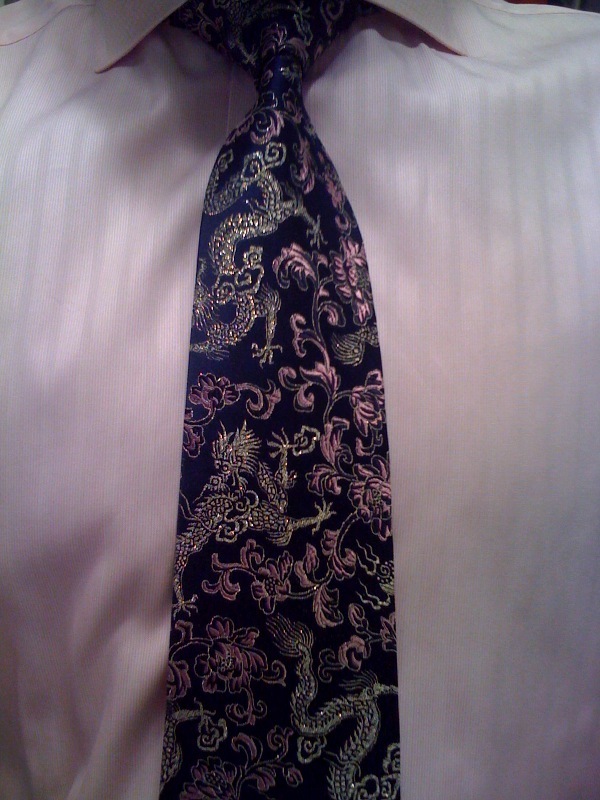 Anyway, the Heiress picked out this tie over the weekend, and I forgot to wear it on Monday. Apparently putting the tie on the doorknob of my closet isn’t enough to remind me. Next time I’ll tie it around my head, samurai-style…mayhaps I’ll see it in the mirror. Before my shower. Gingko Biloba! Againyway, I’m glad I’m making J’s pick the Tie du Mardi, since it’s the Chamber Networking Breakfast today, hosted by the North Shore Retirement Hotel. Gotta look me best, or at least coordinated. We had a couple of splendid clouds at our Networking Breakfast this morning (Yes, I wrote part of this blogpost pre-NeBr), sporting ties, of course. 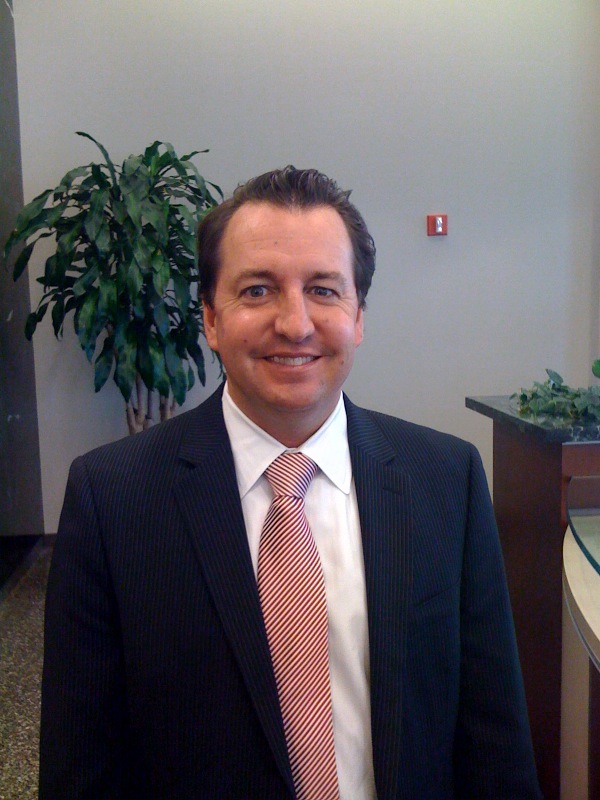 First, we have Robert Adam, proprietor of Adam Insurance Brokerage. 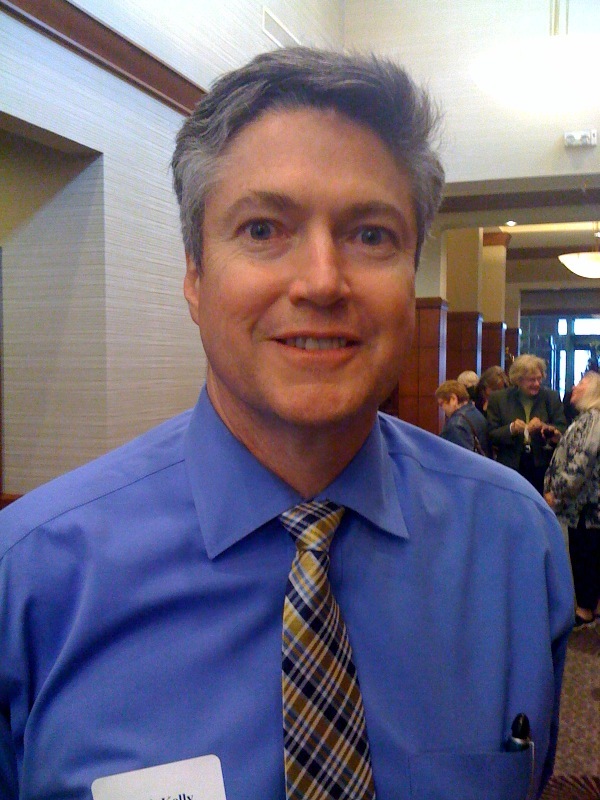 A very nice guy, Bob is a fixture at Chamber events. I saw him later on in the morning, and he had removed his tie. Cheater! 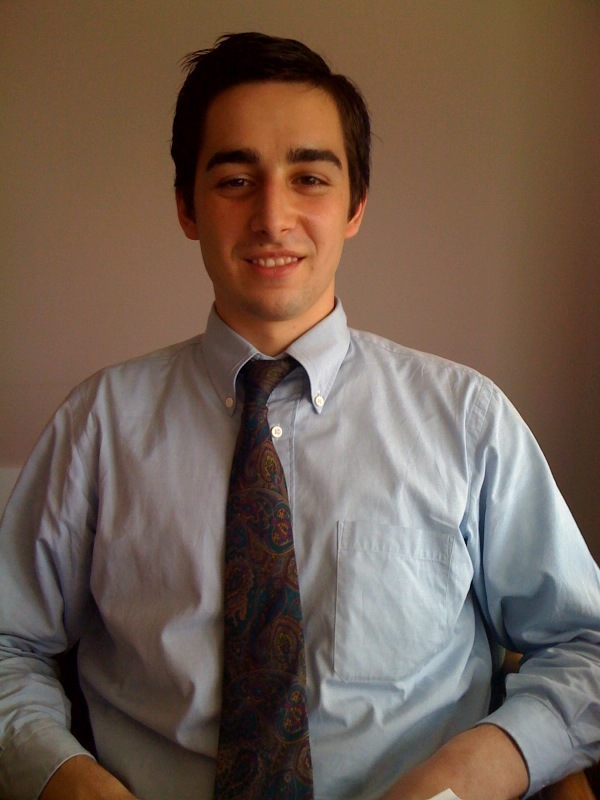 Next we have Eric Fenton, owner of private tutoring firm Across the Board Test Prep. He and his wife attended their first chamber event this very morn (hopefully not their last). Thanks for wearing ties, you Guys With Ties! Bup, bup, bup! Wait a tic…another GWT just came in for a meeting. 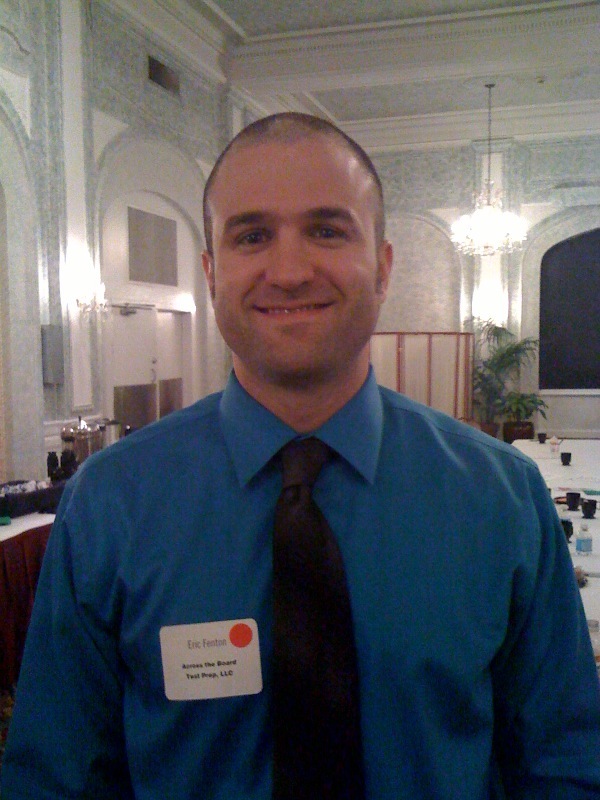 Jake Chamberlain, of Sandbox Industries, sported a vintage paisley while presenting an idea to me. This tie accompanied Jake on a 2-year mission to the Ukraine; that’d be a mission for the Mormon Church, not a spy mission. Thanks for stopping in, Jake. …that was Sunday’s weather. Today’s was almost as nice, except I got to go around in a wool suit. Sweet. Weather is definitely in the top 5 favorite subjects in a ChicagoAreaPerson’s repertoire of discussion topics (and a far #1 in elevators–“How ’bout that [wind/snow/rain/humidity/other]” has GOT to be the most uttered phrase as the doors close, well ahead of “Did that guy just fart?”). The Chicago Blackhawks, as they have made their run to the Stanley Cup finals, have moved pretty much to number 1, but it’s quite temporary, as they will soon be usurped by the Bears. Cubs and Sox move up and down between Nos. 2 & 4, based on their relative suckiness. The baseball clubs must be ecstatic that the ‘Hawks are stealing the headlines, and they must be praying for a 7-game final series (and dreading the days after its end). 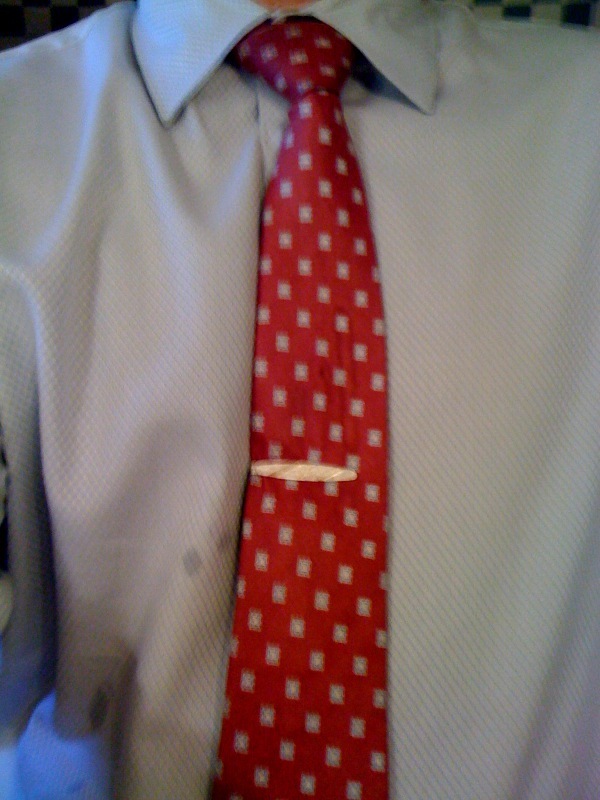 I started with weather because my Tie du Jour was chosen based on something stupid I did on Sunday. I failed to put on sunscreen until it was too late (barn door, meet horse…he went that-a-way). 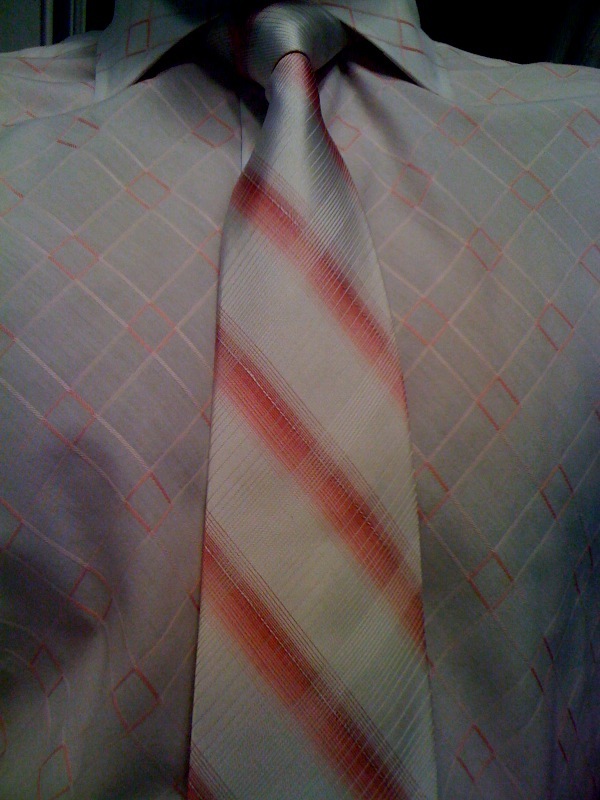 The skin on my front side closely matches the just-past-hot-pink red of this tie. Duh. Mass. The tie is from Isaco, and I think it’s my second from designer Isaac Zelcer, a Cuban emigré (according to this online blurb from 1994). 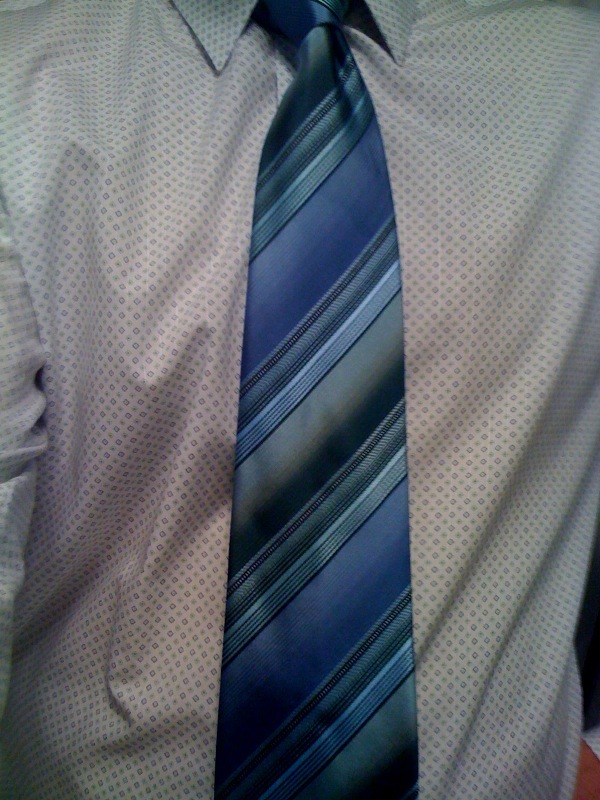 Yes, I just checked my Worn Hanger, and one of my Blue Tie Week ties is from there. So, the sunburn hasn’t completely wrecked my memory. But, one thing it HAS affected is my photo-shooting. Nice focus on that pic, Saucier. 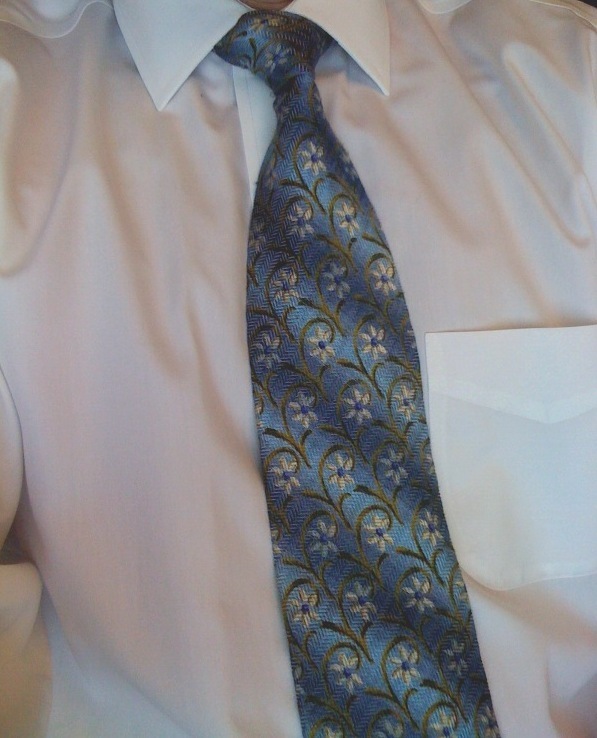 I failed to mention that Friday’s TdJ was Tie #50. A relative milestone, I’d think, since that would make me halfway to my stated goal. However, I have many more than 100 ties, so I may push on (okay, okay, stop your groaning). I guess I’ll have to see how it’s going. I’m still having a great time doing it, and I do have several dozen cards left. Another mini-milestone was reached over the weekend, as I actually have more than one claim on the Friday Freebie. My record has been one…Paul Hletko got the first FF and actually took delivery. The second one also had one claimant, but it was an anonymous nudist who failed to send his/her mailing information. Probably for the best. Friday’s TdJ had a quick applicant in Nicole Colin, a new friend who is a fellow parent at Lincoln School. She actually saw the tie at my flat-warming party, and mentioned that if it were ever the Freebie, she’d get in it to win it. She did it so quickly that you can see her claim as part of Friday’s blog post. 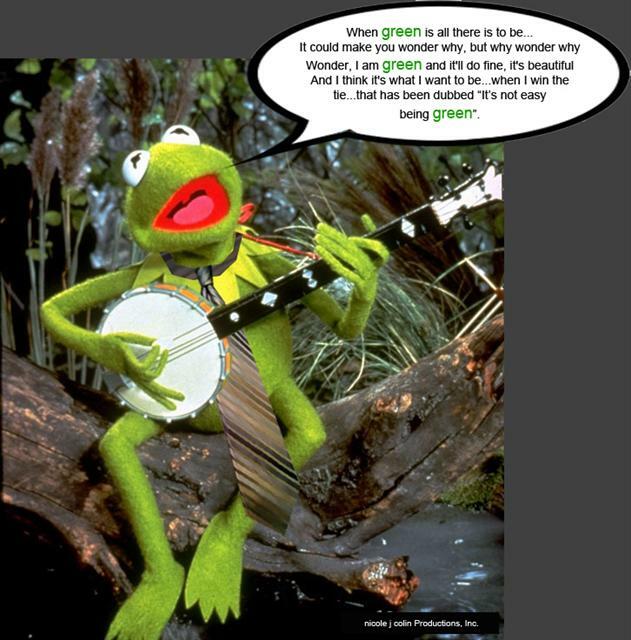 Extremely creative use of the world’s favorite frog (besides Gérard Dépardieu), Kermit. But then…family came into play. My cousin, Elizabeth, knew exactly what buttons to press. I missed her wedding last year, after promising that I would make it. She said that blue and green, the color of the tie, were part of the color scheme of the wedding (which I would have known had I been there), and that her new husband would wear it proudly. She wrote a wonderful note explaining why it should be sent to Texas. And, so, it is with pleasure that I award the Friday Freebie to Elizabeth, and her hubby. Nicole, I’m very sorry…there truly aren’t many entries that would have beaten yours. I hope that I can offer you the Thursday tie (which Kermie seems to like) as a consolation prize. There are two ways to be awake past 1…well, okay, there are about 78 ways, in all honesty, but in the past two nights I have experienced some pretty basic (and rather lame) methods for doing so. We have last night, where it was just pure ignorance of the sleep needs for a man in the 28-48 age bracket (first time that particular age bracket has EVER been cited…thank you very much). And, we have tonight, where I went to sleep before 11, while putting Julia to bed, only to awaken about a quarter past 1. Par-tee on! No matter, I’ll just bang this out and complete our busy Saturday (coffee. swimming lesson. Panera. Laps 4 Lincoln. soccer match. pick up babysitter/party helpers. Julia birthday party. cousins arrive. cousins spend night. sleep, hopefully). That’s a big parenthetical expression, wouldn’t you agree? Yes, our strip of today is from Kenneth Cole. I like their stuff–ties, pants, shirts, you name it. The green & blue pattern simply jumps off of this shirt, also green/blue patterned. As the Friday Freebie, it will jump right out of my flat as well, to the best commenter. We already have a leader in the clubhouse, actually. 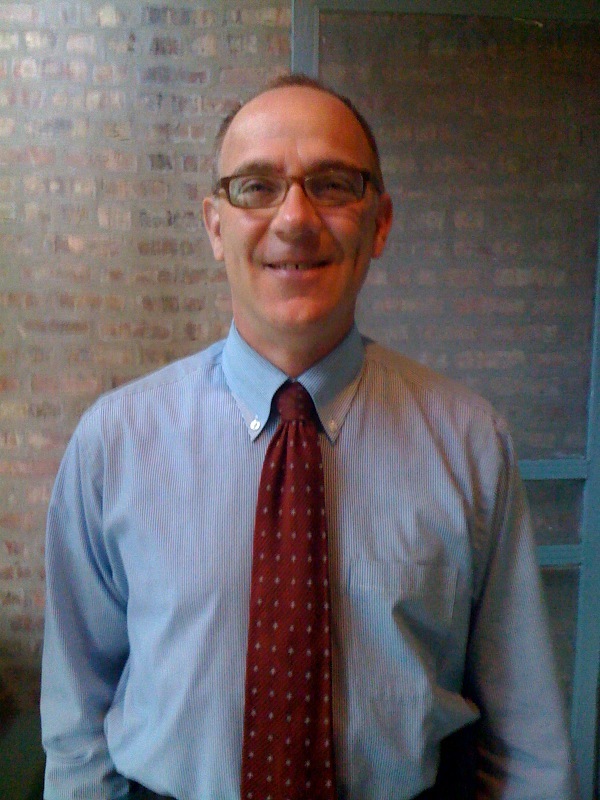 Nicole Colin, of 3dRenderingNow, submitted this amazing photo of a guest Guy With Tie, or Amphibian With Tie, I guess I should say, sporting a strip that looks suspiciously like the Tie du Yesterday. It just begs the question…why ARE there so many…songs…about rainbows? Getting to this pretty late tonight, so it’ll be a shortie. The reason I’m up so late is that I finally watched The Hurt Locker, which I’d rented from the local Video Adventure store a few days ago. They survived the competition from two national chains, right on the same street–Blockbuster and Hollywood Video. Good for them. I had not set foot in there for over a decade. Anyway, the movie was…meh. Can simply not believe it was an Academy Award winner. Avatar was a lot better in so many ways. I think many esteemed Academy voters were voting against the “I’m the King of the World!” screech from James Cameron (as he held his Oscar, the trophy he got for Titanic), not to mention the cheesy “I’m the King of the World!” screech from Leonardo DiCaprio (as he held his Kate Winslet, the trophy that Sam Mendes got). Back to Hurt Locker…I wonder if those bomb squad suits will be all the rage at Hallowe’en. My lack of Guys with Ties for the past two days is just lame. 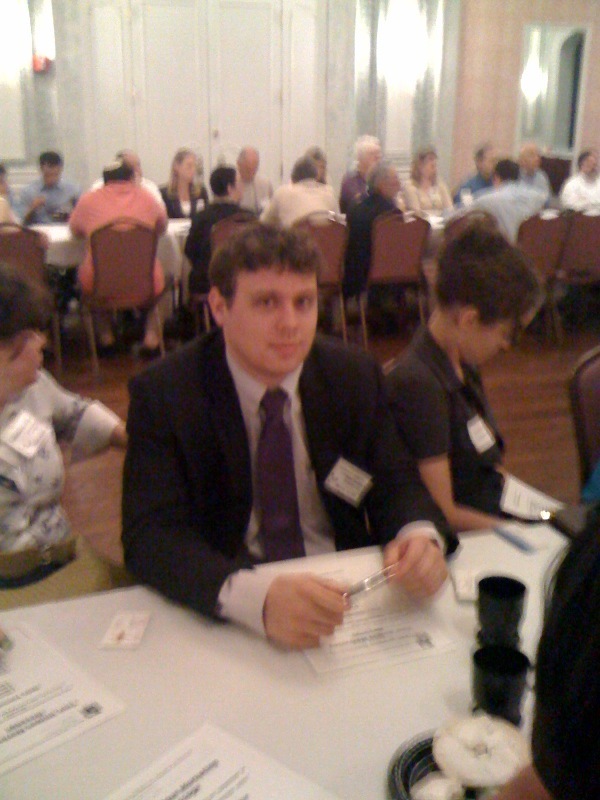 Last night was our Business After Hours, at Schaefer’s Wine, Food & Spirits, and there were plenty of candidates. Same thing for this evening’s event, a ribbon-cutting at Downtown Evanston, the merchant district association for, well, uh, Evanston’s downtown. Sometimes, since I started 100 Days, 100 Ties, I have put on a certain tie, knowing full well that I won’t be wearing it again for a while. But, then I look at the dozens of other ties and realize that I’ll get over it. I am really going to miss this tie/shirt combo, though. It’s another one that I may sneak in, at a later date. I’ll be sure to let you know if/when I cheat. It’s from Pierre Cardin, and it’s very French-ness (French-icity? French-issitude?) is très évident. It just calls attention to itself, and that’s exactly what I was going for, pairing it with a pink/white shirt with a wonderful diamond pattern. I wore my Perry Ellis blue suit with little pinstripes, so the shirt-tie was ALL pop. The scarf (POCKET SQUARE) was of the same color (I’m trying to avoid typing ‘pink/white’ again in this paragra…DOH! ), so, yes, very French. Speaking of French, I have one Mec Avec Cravatte (Guy With Tie) today. 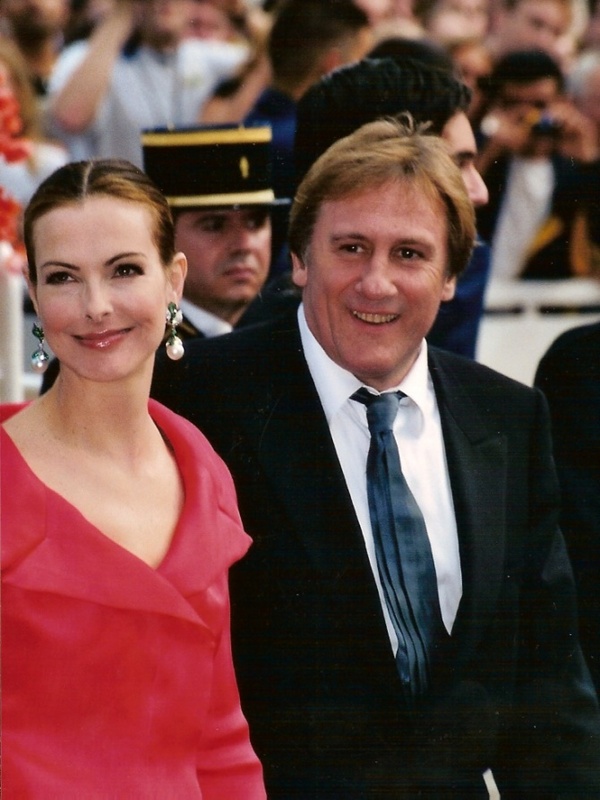 Patrice Robin was a true French gentleman, who unfortunately passed away several years ago. His sister, Michèle Robin Crump, has lived in Memphis for 30+ years and is one of my mom’s dearest friends. He always wore bow ties, and the 3 or 4 times I met him, you could always tell that he just oozed class. Michèle sent me this photo, along with the words, “Voila Patrice Robin et son fameux noeud papillon…I miss him so much.” My mom has one of Patrice’s ties, and has sent it to me to wear–proudly–during Bow Tie Week. 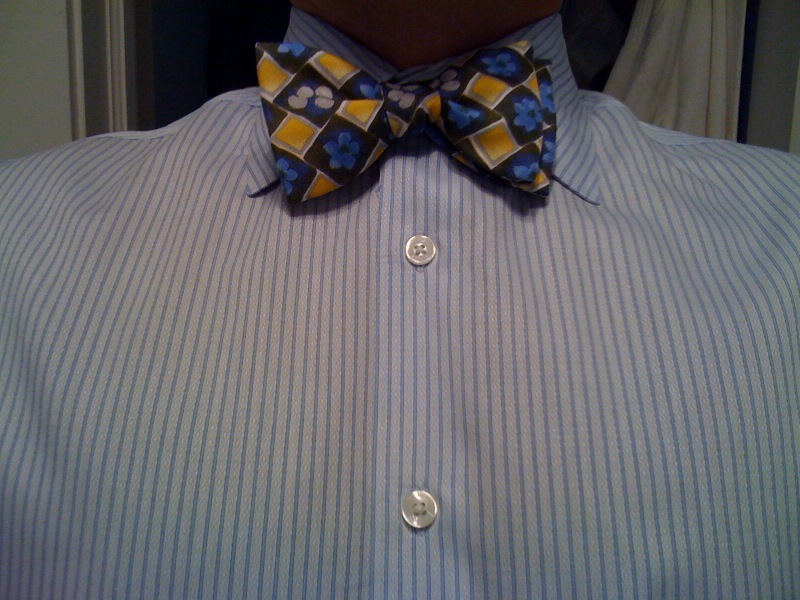 The French for bow tie, noeud papillon means, literally, butterfly knot. I love that. Send some pictures of your loved ones–dearly departed or still around–wearing a tie that made them a part of your memory; along with a story would be nice. While dressing, I noticed that one of my bow ties had fallen on the floor of my closet. Normally, I would have left it there, for days or perhaps weeks. But, since I’m sooooo responsible, I picked it up and put it on. There’s some major thought process that goes into choosing a Tie du Jour. But, apparently, throughout the day, that thought process left me; as I sat and stared at the white laptop screen, it remained a white laptop screen. Yes, I was watching the professional hockey match (here we go, Blackhawks, here we go! Chicago up 2 games to zip over the “do you know the way to” San Jose Sharks), and yes I was making full stretch use of my new wireless capabilities, but…I drew a blank; I shot blanks; I stared and stared at a blaaaaank paaaage. Couldn’t even think of the title. But, after falling asleep numerous times, while thinking, “I’ve got to finish!” I gave up and brought the laptop back into its homebase. Magically, the “can’t spell” piece of my brain kicked in, and I came up with that one. Ahhhh, I knew that I’d wake up and be good again. 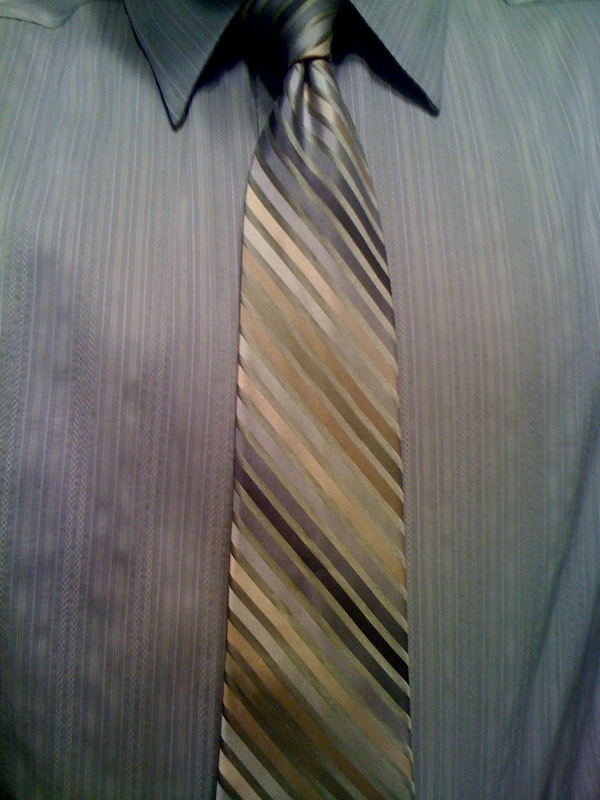 So, the Tie du Jour from yesterday (Tie d’Hier, for you fellow francophiles) is/was a good one. No label, strangely enough, but I’ve had this bow tie for years. I like the yellow touches that seem to go well with the blue and white flowers and the gray background. The BTdJ definitely made the rounds yesterday…lunch at the new Bombay Indian Grill on Sherman, a new-meeting center-warming reception at the Hilton Garden Inn, my daughter Julia’s Team Evanston soccer game (they won 5-1, huzzah! ), and then PizzaFest at Carmen’s Pizza on Church, hosted by the Rotary Club of Evanston. The good thing about wearing a bow tie is that it’s pretty hard to drip hot pizza sauce on it. Or soup. Or wine. Yesterday there were a bunch of gents chalked up on the Guys With Ties board. We had Steve Hagerty, of Hagerty Consulting, and Joe Romano, of Romano Brothers, snapped in the lobby of our building, One Rotary Center. They were heading downtown to hear Gen. Petraeus speak (here’s a great GQ article on him–Petraeus, that is, not Hagerty or Romano). 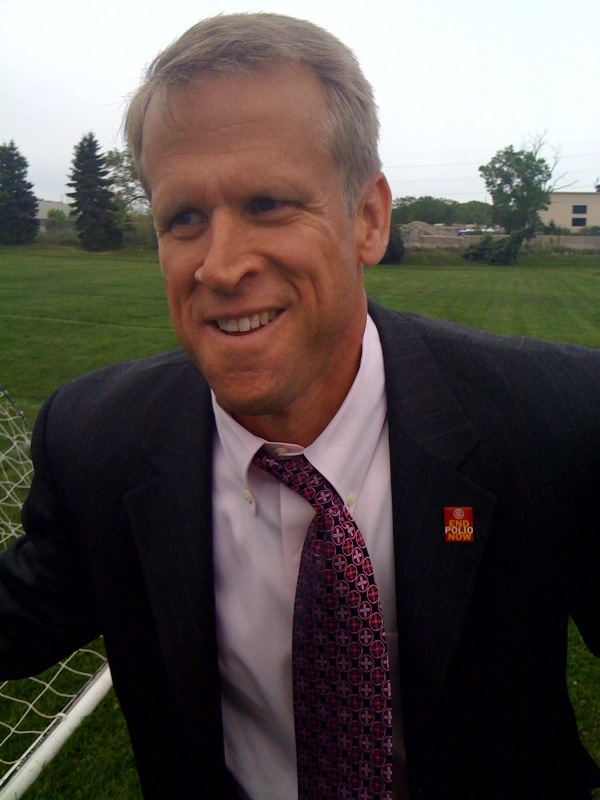 And, finally, John Osterlund, of Rotary International, also wore a tie to our daughters’ soccer game (his Abby scored a hat trick IN THE FIRST HALF), thus ensuring that we’d win any Better Dressed Parents awards, if there were such a thing. So, I smite thee, writer’s block. May ye never rear your ugly face again. Today I maybe got closer to heaven, if in fact there is one, and if in fact it is a nice place for nice people. I chaperoned the Lincoln School 3rd grade field trip to the Field Museum in downtown Chicago (hey, some people don’t know). My daughter Julia and about 39 other kids made the jaunt in a yellow school bus, accompanied by their teachers, Ms. Carlson and Ms. Ceffalio, and about 8 or 9 other chaperones. We were not alone. 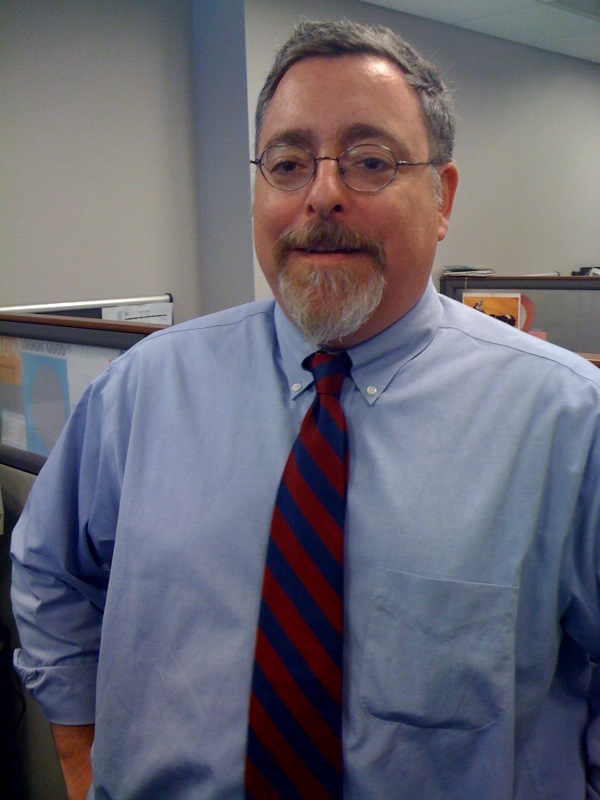 Of course I could have–should have, really–gone into the day sans tie, but my mind projected itself upon the days (weeks, months) ahead, and I tried to figure out which tie I could wear with a bunch of 9-yr olds hanging around. Since those 9-yr olds and their randomly-functioning brains are much like aliens, I thought of this tie almost straight away. 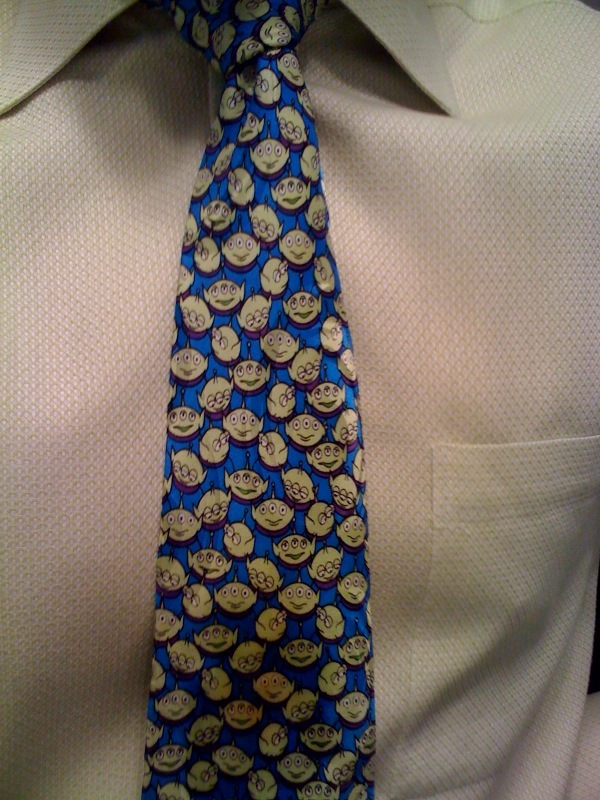 Yes, your brain is on target; you have correctly noted that this Tie du Jour portrays dozens of the annoyingly cute aliens from the Toy Story movie from (wow!) about 15 years ago. I surmised that being on a bus with 40 kids would be like interacting with a gaggle of mindless, otherworldly creatures. Not a stretch. Anyway, I have had this tie for several years, and I’m glad I was able to put it into the rotation on a day where I wasn’t expected to dress like, well, a chaperone for a school field trip. I will admit that I also need to wear a Woody–a Woody tie, perv!– before this is all over. Not sure it’ll happen for another field trip for a while, as I probably earned some major parenting karma points (PKP) today. Over the weekend I ran into–or biked into, rather–David Jones, who is NOT the former Monkee. 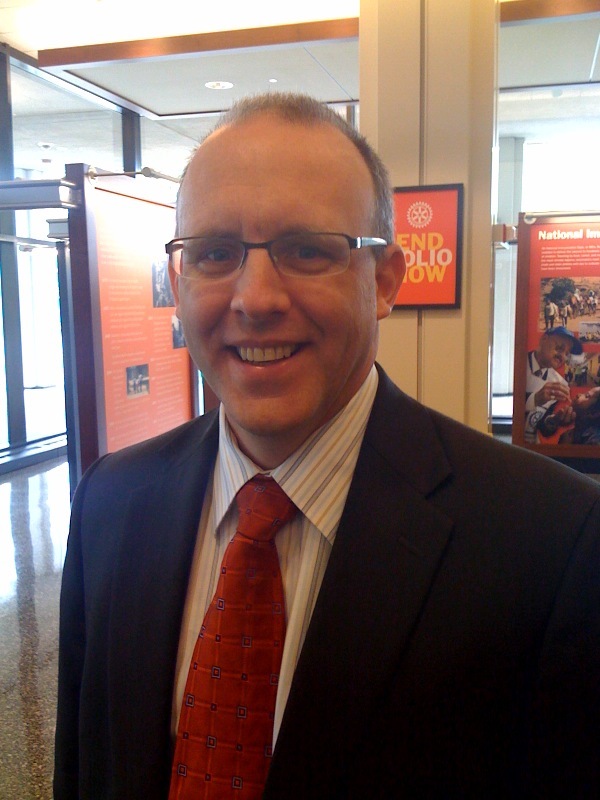 David is an Epicopalian (or Anglican for the Papists out there) minister who works with Connections for the Homeless, an organization which does yeoman’s work striving to transition homeless individuals and families into job and housing situations. 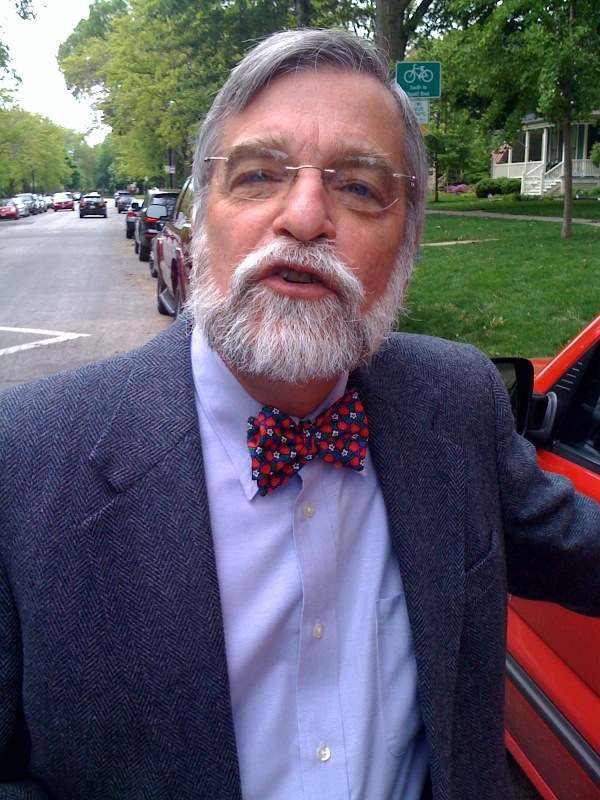 He was wearing this SWEET bow tie, on his way to a wedding, and I stopped on my bike to take a pic of him. It’s hard to tell on this silly iPhone pic, but those little red dots are strawberries. No, silly, not real strawberries, just, well, you know. Ok, well the eyes are drooping, so I must call it a night. Thanks for reading!